that will achieve three things; mature us in our faith, make us complete in Christ, and receivers of the crown of life prepared for those who love the Lord. Our challenges in life have kingdom purpose even when we can’t see clearly while in the testing of our faith. Let’s not miss out on the benefits found in persevering through faith in Christ. Would you agree that life is full of many kinds of trials? You might be in the middle of one right now and thinking to yourself this concept is crazy. I’m supposed to be joyful in this! You don’t know what is going on in my life…..God can’t really expect me to be joyful! 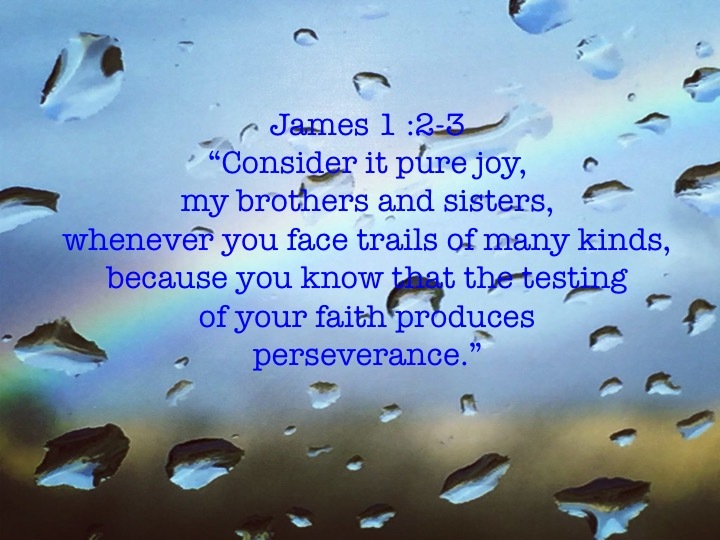 Your right I don’t know what you are experiencing and I pray that you will find peace and joy in the Lord as we continue to explore this counter-culture call to seek after pure joy even in our storms. strengthen me and sustain me through my own trials in life. She continues to preserver through what feels like a never-ending storm. Her faith and trust in the Lord keep her anchored. Her joy encourages others to trust and builds their faith and their love for the Lord. She has defiantly kept her lamp lit and shinning brightly through her storm. I’m so thankful for her light shining into my life and leading me to the strength of the Lord. the word of the Lord is a lamp that shines on our path as we walk with the Lord through life. So if we choose to keep our eyes on how big and faithful the Lord is then our circumstances will return to their proper perspective, small in the hands of God. We are then able to consider life and it’s challenges through the lens of pure joy. Don’t let your light burn out stay connected to the light of the world and our faith builder, Christ, and preserver as you shine brightly for him. Does this mean we will be beaming with a smile all the time as we weather our storms? No, it means that we can remain steady in the storm, anchored in our hope, able to trust we are secure in our heavenly Father’s care and able to be real with those who genuinely seek to come along side us. When we are steady in our relationship with Christ it shines through when we find it hard to smile. Even in the storms of life a rainbow can emerge if His light is shining through the rain or the tears. Keep a look out for His rainbows in your life! Life + Trials = Pure Joy~ Make it true in your life! Welcome if you are joining me for the first time. This post is part of my weekly series “Wisdom Wellspring”. Take a moment to visit the page to learn about the heart behind the series and view previous posts. Yes it is! Thanks for sharing with us. The Joy of the Lord be with you Ginger! Need some more encouragement as you weather the storms of life? Go to my Facebook page and check out the what I shared from John Maxwell. See you there! Love the equation, Sherry! Great post. What a great reminder to me today! Thank you for joining the conversation Kori!